Socks are essential accessories when it comes to outdoor activities such as hiking, hunting, mountaineering or camping in the woods, so having the best waterproof socks is simply the must. A pair of water resistant socks is a necessity in order to keep your feet dry, warm and blister-free and there are plenty kinds of socks to choose from such as Thermolite socks, Merino wool socks and so on. The fact is that even the most sophisticated and specially designed boots and shoes leak and water proof socks will come more than handy on these occasions as they will serve as the last line of defense for your feet. Still, it is good to know that waterproof socks are not the best choice for every hike as they don’t allow your feet to breathe easily as it is the case with ordinary socks. Technology improved in recent years; however, and now we have a solid mix of water resistant socks that offer good breathability as well, so let us get you through the list of the best waterproof socks you can find on the market in 2017. What to look for when buying waterproof socks? Unlike ordinary socks, the waterproof socks are made of three layers. The inner layer gives you insulation, comfort, and keeps the sweat away from your feet, while the outer layer protects the socks from abrasion that can be caused by boots. The membrane in between is there to provide enough air and to keep the water to enter the inner layer, in case it penetrates through the outer one. While the outer layer is commonly made of durable nylon, the inner layer is bamboo, Merino wool, or other material that gives you comfort. Because of their heavy 3-layer construction, the water resistant socks are thicker than the regular ones, so it is important that they are elastic enough to fit any feet and does not give any awkward sensation while hiking. They can be waterproof ankle socks, mid-calf length, crew length, and an even knee length. Some socks have padding on the heels for extra comfort, but this is optional, and you can opt for it if you want to add more cushioning to your feet. In the text below, you can read our waterproof socks reviews as we conducted a thorough research on the best waterproof socks currently available on the market. These high-quality waterproof socks have the ability to keep your feet safe and dry even in the most rigorous conditions. The perfect fit and excellent durability are provided thanks to the outer layer, which is made of elastane and abrasion-resistant nylon. Comfort, cushioning, and odor elimination is guaranteed because of the inner layer that is made from Merino wool, while the Porelle hydrophilic membrane is crucial in bringing protection against water. The Dexshell Hytherm are fantastic socks, suitable for various activities such as mountaineering, trekking, hiking, hunting, backpacking, and everyday use. They are mid-calf length socks, and in case you’re looking for waterproof ankle socks, these are not the type you need. These DexShell waterproof socks offer fantastic breathability thanks to Porelle membrane, but also keep your feet dry and safe from bacteria. 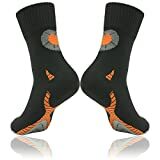 The outer layer is extremely tough and will fend off water penetration, while the inner layer provides softness and comfort, so you can rely on these sock when hiking. Talking about comfort, the DexShell includes extra cushion that runs from the toes to the calf, and it will help in preventing blisters to form during long hikes. 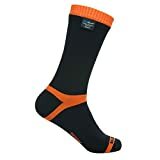 These mid-calf socks are particularly designed to withstand all types of weather and we could say they are quite universal and versatile, so you can use them on any occasion when it comes to outdoor activities. Another top quality water resistant socks that will secure protection from both water and wind, especially made for rough weather, so they are not recommended to use during warm and hot days. The outer layer is made of elastane and nylon, while the inner layer is 35% Merino wool. 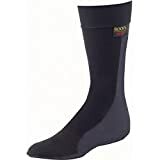 These SealSkinz waterproof socks will not let moisture to get to your feet, and are very durable, comfortable, and odor resistant. The cupped toes and heels are there for additional warmth, while they fit perfectly, so you don’t have problems with blisters because they cannot slide. You don’t need to worry about proper blood circulation as these socks will not disrupt it in any way. Despite being highly waterproof, these SealSkinz socks are not the warmest ones you can find in the market. In case you step in deep snow, you may feel a bit cold, so the best thing to do is to protect them with additional wool socks, and you’re ready to go. When the outdoor conditions are extremely wet and you’re seeking for the waterproof socks, these Hanz crew socks are perfect for hiking through the swamps or even for water sports such as canoeing and kayaking. As it is the case with other water resistant socks, these are also constructed from three layers. The outer layer is made of Lycra and nylon, and it will keep the water away, while the inner layer is from specialized Hanz Wicking Liner. These abrasion resistant socks are durable, moisture wicking, and quick drying, while they can stretch which makes them to fit excellently. 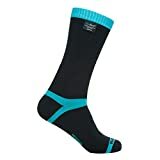 For the people whose feet are sweating a lot, the breathability of these is what makes them as one of the best waterproof socks currently on the market. Their versatility to work well in both winter and summer is an additional upside, so you can easily pair them with adequate boots and shoes. Very comfortable and breathable waterproof socks, these RANDY SUN socks come in a variety of colors and designs, suitable for both men and women. Thanks to the heel’s “Y” structure, the sock will not slip and the comfort is guaranteed. The outer layer is made from 74% nylon, 23% Lycra, and 3% elastane, while the inner layer protects water from coming in and keep your feet dry and away from bacteria and foul odor. These socks are easily washable by your hands, and all you need to soap them and wash under warm water. 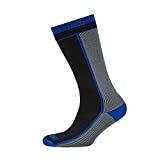 The RANDY SUN socks are probably the best for casual use from all the socks we mentioned here, and going through waterproof socks reviews in this text, they are by far the most appealing by their design. Likely one of the best waterproof socks in 2017, Rocky designed them from high-quality waterproofing materials, so you can use them in the coldest conditions, and even hike through Alaska or Siberia. Not only that you can wear them on the land, they will keep your feet warm in deep water as well because waterproofing is their biggest asset. The Gore-Tex inner layer technology is destined to keep the water out constantly, while sweating will not be a problem as your feet will stay dry all the time. 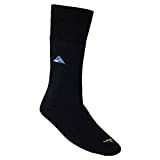 Although a bit expensive, these socks have everything you need to protect your feet on harshest weather conditions, so they are surely one of the best waterproof socks currently in the market. Waterproof socks are a significant part of accessories if you are an outdoor enthusiast and like to spend time in cold and wet weather. That’s why is crucial to find yourself a suitable product in order to keep your feet warm, dry, and fungus-free. We hope that you will be satisfied with our water resistant socks reviews as we selected the best gear of this kind to provide you with all the necessary details you need to know before deciding to purchase.